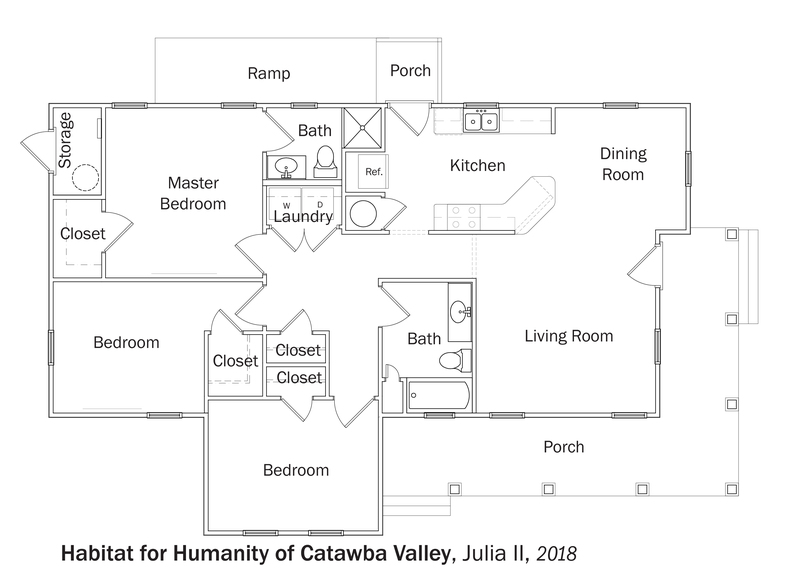 Habitat for Humanity of Catawba Valley built this 1,240-square-foot affordable home in Hickory, North Carolina, to the high performance criteria of the U.S. Department of Energy Zero Energy Ready Home (ZERH) program. Deep porches protect windows from rain and overhead sun and provide a naturally cooled place to gather in mild weather. Architectural 30-year shingles cover coated OSB roof decking on the simple gable roofs, which are steep pitched to encourage drainage in the humid climate. ENERGY STAR appliances and ceiling fans, LED lighting, and water-saving plumbing fixtures help reduce energy and water usage in the efficient home. The crawlspace was sealed and insulated along the inside with R-10 of rigid EPS foam, while an extra-thick layer of visquene serves as a vapor barrier over the crawlspace floor. The sealed conditioned crawlspace provides a clean, dry, and temperate environment for the home’s supplemental dehumidifier. The 2-by-4 walls exterior walls were constructed with advanced framing details including insulated corners, insulated headers, and ladder blocking for insulated intersections that left more room for the R-15 blown-in fiberglass cavity insulation. The exterior was sheathed with OSB then covered with R-10 EPS rigid foam with taped seams. Over the taped rigid foam board, 2-by-4 furring strips were attached with structural screws to provide a ventilating air gap and drainage plane under the engineered wood lap siding. A single mini-split ductless heat pump was installed on the wall above the front door to provide heating and cooling to the home with a very high efficiency of 23 SEER and 11 HSPF. The home’s hot water is provided by an efficient heat pump water heater. Click on the box to learn more.